It always seems so straightforward on TV. You have a cardiac arrest, a handsome doctor rushes to your side, shouts “Clear!” and gives you a couple of zaps to the chest with electricity-generating paddles, and—ta-da!—you’re back in business. Cue the tears and music. But in reality, a cardiac arrest is a much more complicated business, and one with considerably more peril than you might realize. A new study shows that the chances of surviving a cardiac arrest outside a hospital are slim indeed—around 1 in 22 (about 1 in 12 if someone tries resuscitation). TUESDAY, Sept. 23 (Health.com) — It always seems so straightforward on TV. You have a cardiac arrest, a handsome doctor rushes to your side, shouts “Clear!” and gives you a couple of zaps to the chest with electricity-generating paddles, and—ta-da!—you’re back in business. Cue the tears and music. But in reality, a cardiac arrest is a much more complicated business, and one with considerably more peril than you might realize. One study shows that the chances of surviving a cardiac arrest outside a hospital are slim indeed—around 1 in 22 (about 1 in 12 if someone tries resuscitation). However, your chances are also better in some cities than others, according to the study published in the Journal of the American Medical Association. In fact, if you have to pick a city to have a cardiac arrest in, I’d say Seattle is probably your best bet. For example, 16% of people who were treated in Seattle for a cardiac arrest outside of a hospital survived, compared to 3% in Alabama. And nearly 40% of those with ventricular fibrillation—a condition in which the heart quivers with uncoordinated contractions but hasn't completely stopped—survived in Seattle, compared to about 8% of those in Alabama. To be clear, we’re talking about conditions in which the heart stops beating and requires a shock to get restarted. We’re not talking about heart attacks, in which the heart is still beating and people are (usually) in a world of pain due to a blocked blood vessel. A heart attack, however, could become a cardiac arrest if you don’t get help soon enough. It’s not that common, though. Cardiac arrest is the loss of mechanical activity of the heart that often begins as ventricular fibrillation. It can be caused by previous heart damage, drowning, electric shock, or other reasons. 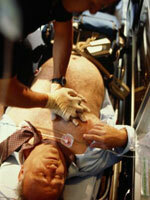 But still, cardiac arrest survival rates were higher in some regions than others. Next: So why the city-to-city difference in survival? So why the city-to-city difference in survival? The researchers found a five-fold difference in an area’s survival rates after emergency workers treated the patients—suggesting that cardiac arrest treatment could be improved in some areas. “Our study suggests that cardiac arrest is a treatable condition,” says Dr. Nichol. People are also more likely to survive if a bystander starts CPR or uses an automated external defibrillator, the heart-shocking devices available in malls, airports, and other locations. In the study, bystanders attempted to perform CPR prior to the arrival of ambulance workers only 31% of the time. Dr. Nichol recommends that bystanders "recognize and respond quickly by providing CPR, applying a defibrillator to the chest if one is available, and calling 911 so that paramedics will arrive quickly and continue care." If an individual is sitting up, is awake, and is complaining of chest pain, it's not a cardiac arrest. Cardiac arrest is the third leading cause of death in this country, says Dr. Nichol. “Since it is so common, and success in treating cardiac arrest varies so much from city to city, cardiac arrest should be designated a reportable condition." Reportable conditions are those monitored by the government, which can help researchers find ways to reduce the risk of such conditions. "Every community can monitor and improve its response to cardiac arrest,” says Dr. Nichol. CNN.com: Is it a heart attack, cardiac arrest or stroke?